Marriages from 4/11 1819 until 8/12 1826. 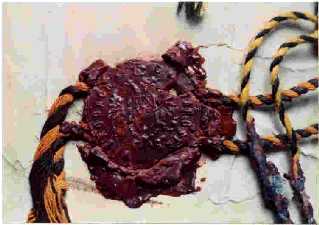 The Austrian Eagle is at the center of this wax seal. The multicolored cord was typically part of the binding of such metrical books (i.e., books containing vital records). This strategem prevented anyone from removing a page or adding one that was not officially recognized by the government. 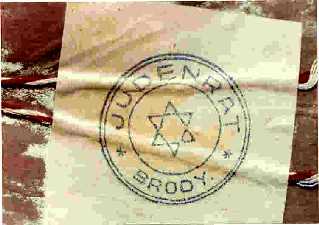 This seal and its cord, from a Brody Metrical Book listing Jewish births and kept by the Judenrat in the Brody ghetto, literally sealed the fate of the Jews there. The cord, as was customary, was still part of the binding. Now, by preventing any pages from being surreptitiously removed from the book, it ensured that the names of all the Jews born in Brody were known to the Nazis. Had it been possible to remove any pages undetected, some of the Jews whose names were recorded might have been saved.